I'm not generally one to fake tan for many reasons: the awful smell, the staining, having an unnatural substance covering my body. Not to mention the fact that an hour in the sun during summer leaves me with all the tan I need anyway (although not ideal health wise). 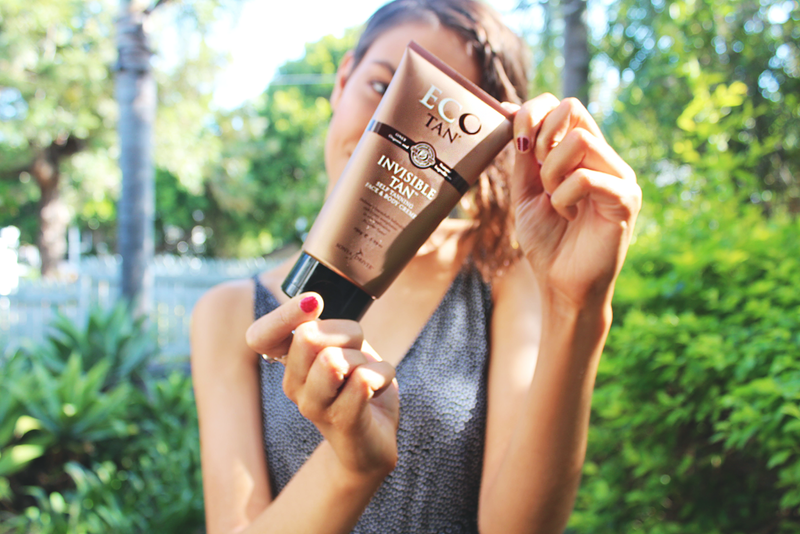 But as mentioned in my previous post, I've been looking into natural and organic products more and more lately and read about Eco Tan. I used the Invisible Tan moisturising lotion which is Australian Certified Organic and recommended for medium and olive skin tones (lighter skin tones are more suited to the Winter Skin lotion). Originally I bought it to use just on my face which is always very pale in comparison to the rest of my body, but decided to try it out on my whole body and I'm really happy with the results. You just apply to clean, dry skin and it will continue to develop for up to 8 hours. Perfect for before bed. What I love about this product is that it's colourless which means no stained sheets or clothes and the smell is much less intense than other tanning products. There's no nasty chemicals and it gives you a nice even tan that's brown and not orange. Check out my results above! It lasts for between 7 and 10 days and from what I've read, it fades evenly as your skin sheds, so no blotchy spots. If you're looking for a great fake tan I rate this one highly. You can find your nearest stockist here or purchase them online.